Birmingham We Are is all about achieving growth and success for Birmingham through engaged, empowered and inspired people and communities. Birmingham We Are is a Community of Passion that utilises FreeTimePays digital engagement and social media to deliver real change and positive social impact. ‘People with Passion’ are given the digital space and the digital tools so they can make a real difference for themselves and others. 05 Feb 2019 - Elliott Brown Did you know? It was not just jewellery that was made in the Jewellery Quarter. Pens were made there too! Joseph Gillott made pens at his Victoria Works factory on the corner of Frederick Street and Graham Street. You can see a display of some of his pens at The Pen Museum on Frederick Street. There is also a marble bust of Joseph Gillott in the Council House. He was born in Sheffield in 1799, and he died in Birmingham in 1872 aged 72. He moved to Birmingham in 1821. He started manufacturing steel pens with machinery from about 1830. The Victoria Works on Frederick Street was opened in 1840. His home for many years was 'The Grove' on Westbourne Road in Edgbaston. The marble bust (below) of Joseph Gillott is seen at the Council House and was made by the artist Peter Hollins (1800 - 1886). You can see it close to the main entrance on one of the sides near a wall. The Pen Museum is a museum in the Jewellery Quarter, at the Argent Centre located on Frederick Street. The building itself used to be a pen factory and is a Grade II* listed building. A look at the Joseph Gillott display at the museum. I visited during Birmingham Heritage Week back in September 2016. On the wall Joseph Gillott Pen Maker to the Queen. Showing various steel pen nibs. This table cabinet display about the Victoria Works (more on that later in this post). It had various Joseph Gillott steel pens and steel pen nibs inside. As well as photos of his marble bust, his portrait and his grave at Key Hill Cemetery. Close up look at one of Joseph Gillott's steel pens made in about 1845. His company has been making pens since 1827 and is now part of William Mitchell Ltd.
1001 Spring Ground Mammoth Quill Circa 1845 - The Largest Pen Made. The Victoria Works is a Grade II listed building not far from The Argent Centre on the corner of Frederick Street and Graham Street in the Jewellery Quarter. I saw it after my visit to The Pen Museum during Birmingham Heritage Week in September 2016. It was formerly listed as the Flagstaff building. The main building seen on the corner was built from 1838 to 1845. Made of red brick with ashlar and stucco dressings. The steel pen factory of Joseph Gillott opened up here in 1840. On the Graham Street side is a blue plaque for Joseph Gillott from English Heritage. The plaque reads: "These were the premises of JOSEPH GILLOTT 1799-1873 Steel Pen Manufacturer". This was probably the main entrance to the Victoria Works. This next building, part of the Victoria Works on the corner of Graham Street and Vittoria Street was built in 1887. Other parts of the former factory were built in 1850. On the Graham Street side is medallion bust of Queen Victoria, probably installed for her Golden Jubilee. This building post dates the death of Joseph Gillott. The view of the Victoria Works from the corner of Graham Street and Vittoria Street. There is a modern roof section closer to the Vittoria Street side. This building is also of red brick. No longer a factory, there are various different small companies occupying the building. If you stop to look at the pavement on Frederick Street (or other nearby streets in the Jewellery Quarter), look out for these that are part of the Charm Bracelet Trail. I saw this one for Joseph Gillott in December 2012. It reads: "C 1840 Hi Nibs. Joseph Gillott opened Victoria Works". Photos taken by Elliott Brown. Well, there has been no snow in Birmingham, while the rest of the country has had a dusting of the white stuff. Somehow Birmingham stayed mostly dry with blue skies! Looking back to previous years when it did snow in Birmingham. To our wonderful statues covered in snow! For instance see Victoria Square covered in snow in January 2013! Iron: Man by Antony Gormley (now in storage). To the right was the Town Hall and can you see the Alpha Tower? This was on the 18th January 2013. A very snowy day in the city! The statue was moved into storage in 2017 for the West Midlands Metro extension to Centenary Square. The extension from Victoria Square onto Paradise Street is far from finished! Gormley made it in 1993. The Floozie in the Jacuzzi is looking freezing on that snowy day in January 2013. The fountain was still working at the time. The sculptures here made by Dhruva Mistry in 1993. This area is now full of plants like a landscaped garden as the council was finding it difficult to repair the fountain all the time! Victoria Square House behind. One of the Sphinx Guardians in Victoria Square facing the Council House. Covered in snow during January 2013. Also by Dhruva Mistry in 1993. The other Sphinx Guardian in Victoria Square facing Christ Church Passage, also seen during that same snowy day in January 2013! Also by Dhruva Mistry in 1993. 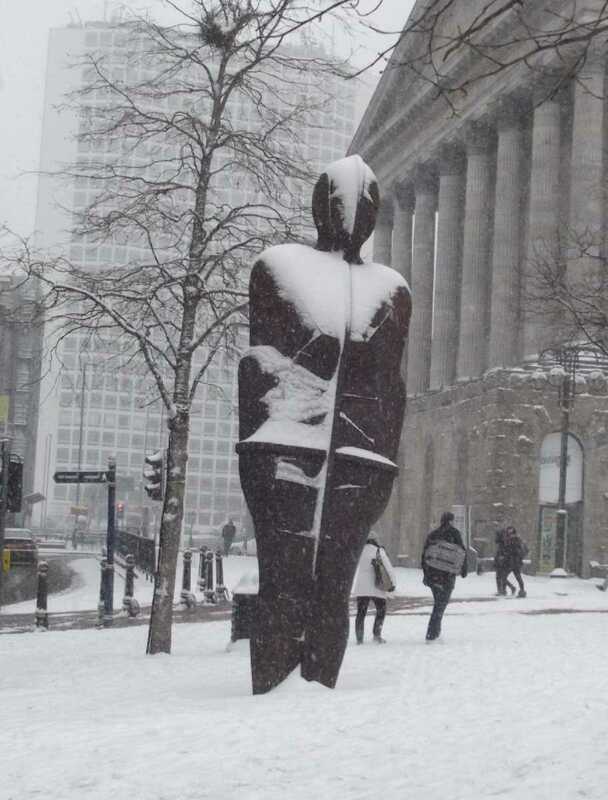 The last major snow event in Birmingham was during the Beast from the East during early March 2018. It was freezing back then! It was snowing at the Bullring and you can see a light dusting on St Martin's Church and the statue of Horatio Nelson. There was more proper snow a few days after this, and a couple weeks later during the second Beast from the East event. Statue by Richard Westmacott in 1809. Probably one of the oldest statues in Birmingham! St Martin's Church seen behind. The bronze statue of William McGregor in the snow of January 2010 at Villa Park. Statue made in 2009 by Sam Holland. See my post on him here William McGregor: Director of Aston Villa and Founder of the Football League. One of my earliest visits to the University of Birmingham was in December 2009 to see the statue of King George I outside the Barber Institute of Fine Arts. Made in 1722 by John van Nost the Elder it was in Dublin, Ireland until it was moved to Birmingham in 1937. Bank Tower Two at the Leftbank development is now structurally complete, a beautiful day for this photo update, more in the full post. 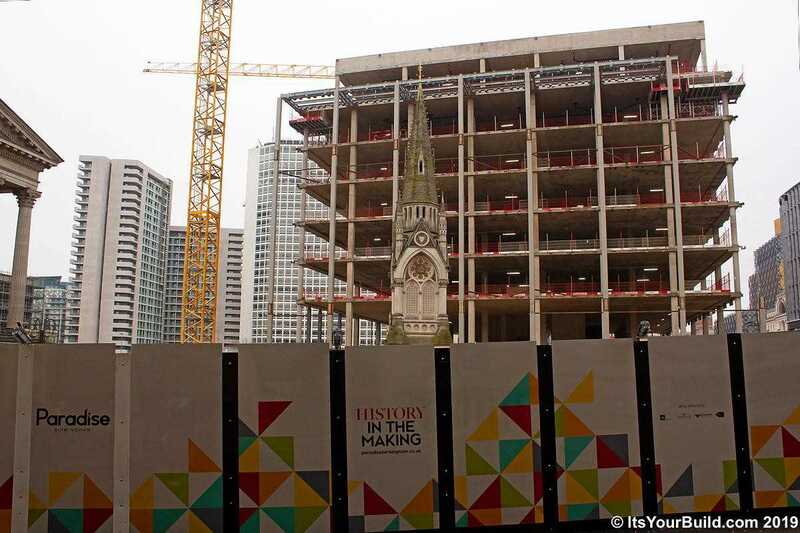 In this post we take a look at how the Birmingham skyline has changed over the past 12 months. All images have been taken from Clent Hills by Birmingham's People with Passion, Daniel Sturley. 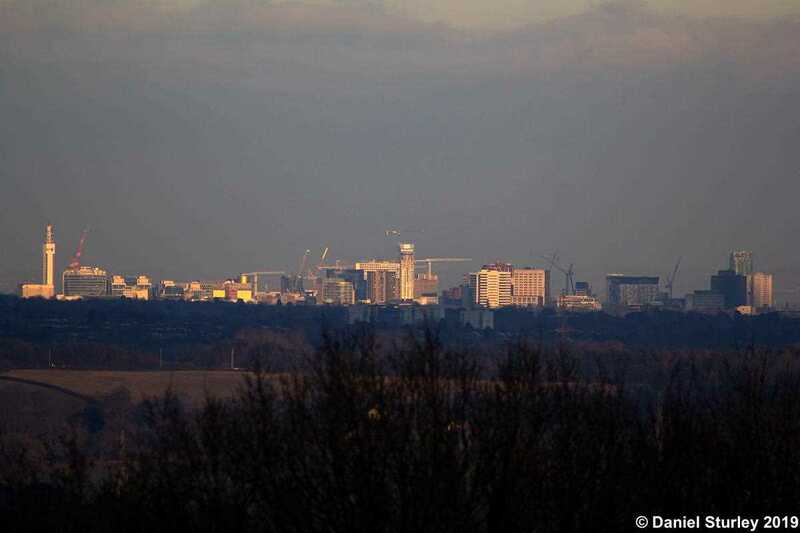 Birmingham skyline as seen from Clent Hills (February 2019) - zoomed in. All photography courtesy Daniel Sturley. 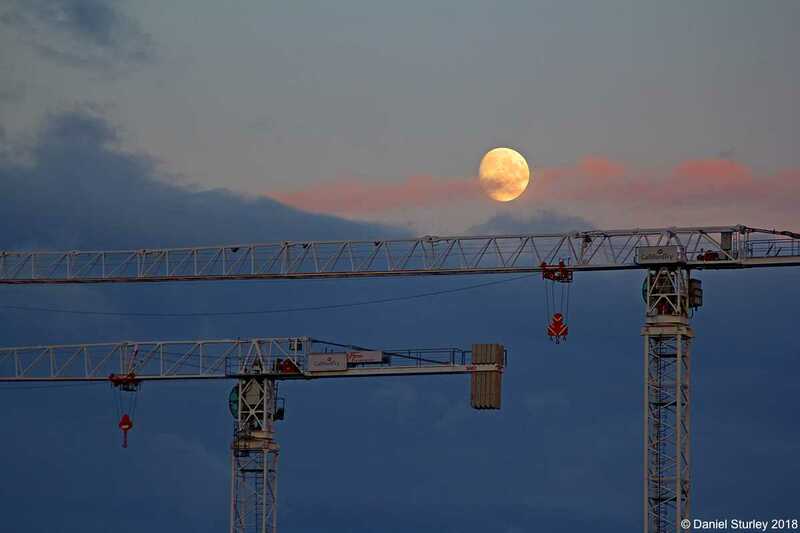 Photos of cranes across the city between September and January 2019. 02 Feb 2019 - FreeTimePays Did you know? Daniel Sturley, a member of the community and follower of all things construction, was recently invited to join Wates at a ceremony to mark the 'topping out' of Bank Tower Two. But what is 'topping out' and what are these 'time-capsules'? Here we share with the community, the reason behind, and the history behind, these ceremonies. In the construction industry 'topping out' which is also referred to as 'topping off' is normally held when the last beam is placed atop a structure. The practice of "topping out" a new building can be traced back to an ancient Scandinavian rite which involved the placing of a tree atop a new building. Here the Wates team perform their 'topping out' ceremony atop Tower Bank Two. 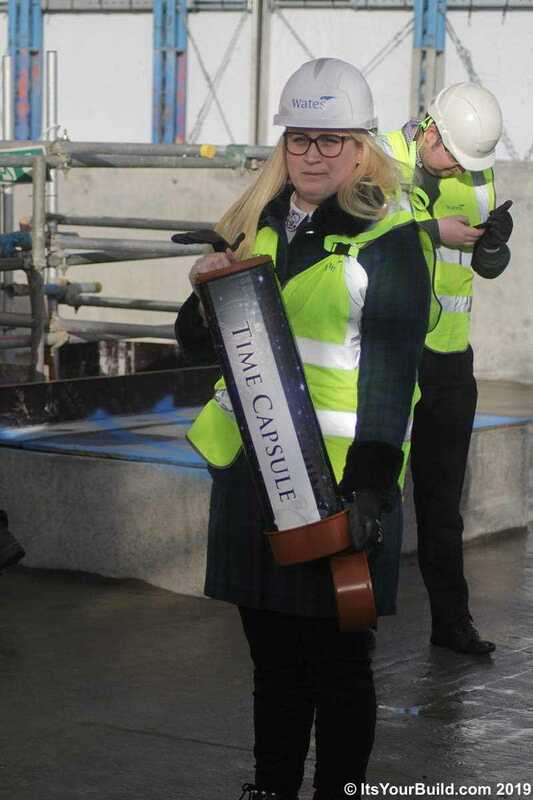 And what about the 'time capsule'? A time capsule is a cache containing goods and information specific to the time period in which the build took place. Where it is placed or buried is often a well protected secret. Here's the Wates team with their time capsule. Go here to see how the British Library suggests a time capsule is prepared. All photography taken by Daniel Sturley. On the 14th January 2019 the City of Birmingham celebrated being a city for 130 years. A visual display outside the Council House after dark from 4pm to 6pm that day. Brum 130 Beyond Bricks and Mortar was a film projected onto the side of the Council House by the graffiti artist Mohammed Ali (also known as Aerosol Ali). In this post is photo gallery from that evening as I passed through! The full title of this projected film was Brum 130 Beyond Bricks and Mortar . Birmingham received City Status on the 14th January 1889. On the 14th January 2019 there was an event held in Victoria Square between 4pm and 6pm. It was still getting dark by 4.30pm to 5pm. I went to check it out briefly on the day after 5pm. The film was by Mohammed Ali also known as Aerosol Ali. 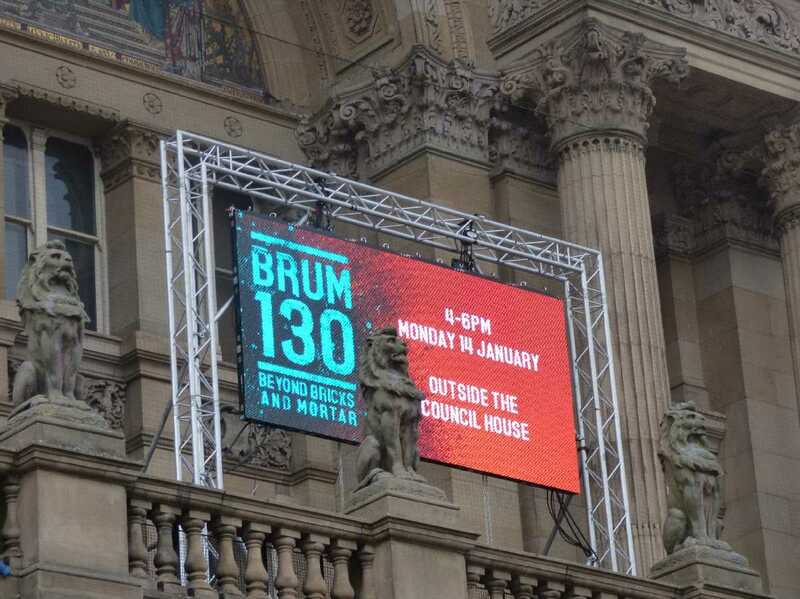 This digital billboard seen on the Council House balcony on the 13th January 2019 (a day before the anniversary). I actually took these photos from the top of Victoria Square starting at Colmore Row, going down the steps. But it actually looks better seeing the photos in reverse! Some bonus photos commemorating the last major anniversary of Birmingham's City Status which was back in 1989 (30 years ago). Saw this plaque in the Council House while I was at Birmingham We Are's event back in early November 2018. On Maundy Thursday 23rd March 1989 this plaque was unveiled to commemorate the visit of Her Majesty the Queen during the City of Birmingham's Centenary Year. I've had this medallion souvenir for around 30 years (so have had it since sometime in 1989). It was an Official Souvenir Medallion for the City of Birmingham Centenary. On this side showing a version of Birmingham's famous Forward coat of arms. On the reverse it says City of Birmingham Centenary Festival 1889 1989. Has anyone thought of making a souvenir for 2019? City of Birmingham 130th Birthday 1889 2019! Photos taken by Elliott Brown in Victoria Square in mid January 2019. 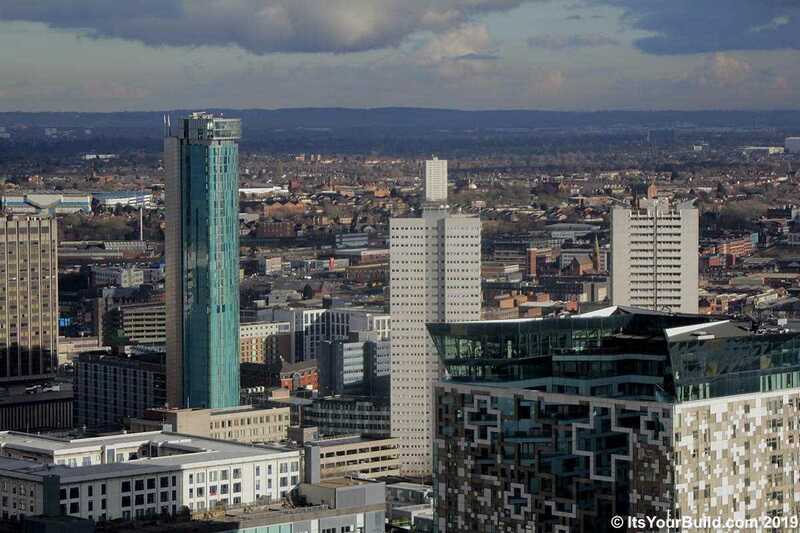 Daniel Sturley, a Birmingham community photographer and one of the City's incredibly talented and inspired 'People with Passion', was invited by Wates to the topping out ceremony at Bank Tower Two in Birmingham to take some skyline photography. Just take a look at the view from up there! What a brilliant gallery of photography! 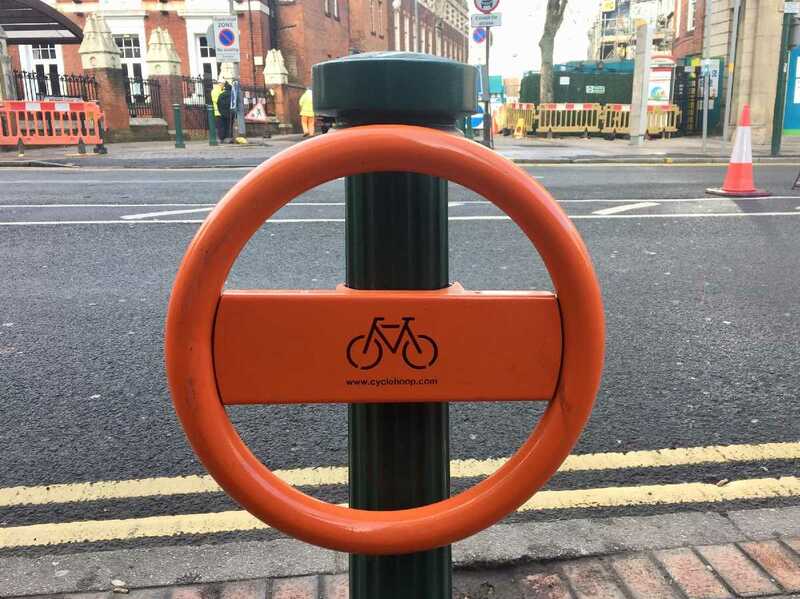 New bicycle stands have appeared around the city centre for cycling enthusiasts to lock their bikes to whilst they work or shop. New stands have been spotted around Steelhouse Lane, near the Birmingham Children’s Hospital, as well as on Edgbaston St outside Debenhams in the Bullring. These new stands are no doubt part of the Birmingham Cycle Revolution, an ambitious 20 year plan to support cyclists across the city. The project aims to make cycling an integral part of the city’s transport network with cycling part of everyday life - their vision is for 10% of all journeys in Birmingham in 2033 to be made by bike. Birmingham Cycle Revolution projects have included upgrades to the city’s canal towpaths and the creation of cycleways along the A38 (Bristol Rd) and A34 (Perry Barr in to/out of the city centre). 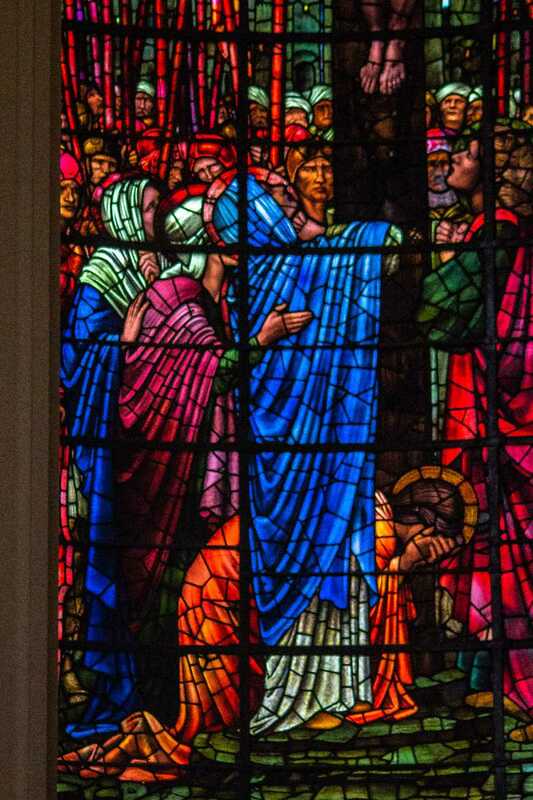 A lovely collection of photography taken by Pete Davies 'people with passion', during his guided tour of St. Philips's Cathedral, Birmingham. I'm a big fan of the Back to the Future, Ghostbusters and Batman movie franchises. So when I heard that the famous movie cars were coming to Birmingham, I had to see them! The DeLorean from the Back to the Future Trilogy, Ecto 1 from Ghostbusters and Ecto 1A from Ghostbusters 2. Even the Batmobile from Batman (1989) has been to the city! The Acocks Green Village BID held an event in the village on the 1st August 2015 called the Alien Invasion of Acocks Green. And this is when the Back to the Future DeLorean visited. Seen near some shops on the Warwick Road. This appears like the famous movie car as it was in the hit movie Back to the Future Part II (released in 1989). You also see it hover converting at the end of the classic 1985 movie! A Marty McFly impersonator was on site dressed like Marty was in the second movie. With the colourful baseball hat and the self drying jacket! The movie went to 2015 with hoverboards, flying cars etc. But none of this technology happened by the time we were in 2015! 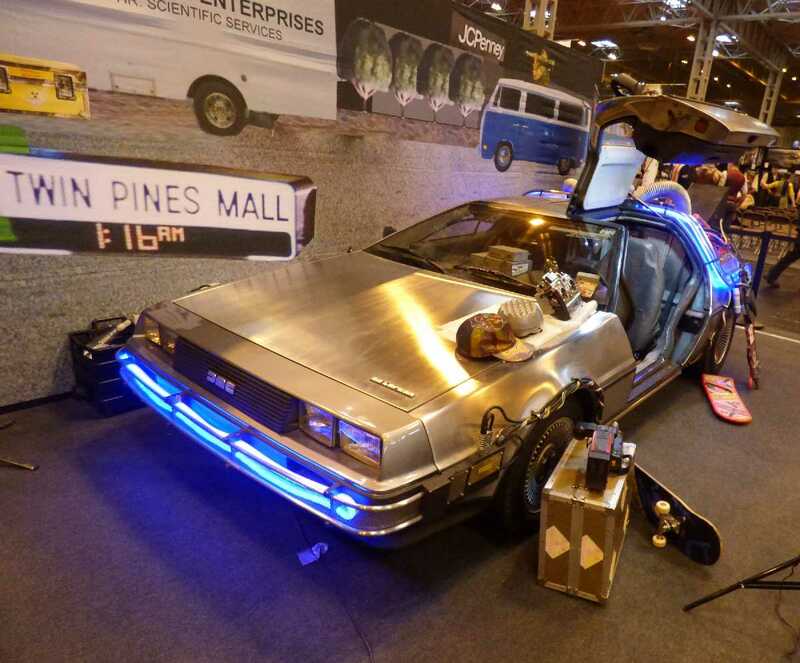 The second DeLorean I saw from Back to the Future was at the MCM Birmingham Comic Con, held at the Birmingham NEC. I went to the comic book convention in November 2016. Don't usually go to things like this much, and this was the only MCM Comic Con I've been to. I've not been back since. This DeLorean also resembled the version from BTTF Part II. And this time was an man dressed as Doctor Emmett Brown, aka the Doc! Along side the car was various skateboards and hoverboards based on those used in the movie. Including the Pit Bull used by the bad guy Griff Tatten. While Marty McFly used a Mattel Hoverboard! Front view of the DeLorean at the MCM Comic Con at the NEC. Gull wing door open and and some of the hats from the second movie. Also seen behind was an image of Twin Pines Mall from the first movie. Doc used Plutonium to power the DeLorean and when it hit 88 miles per hour it went back or forward in time! By the end of the first movie and into the second, the Doc had replaced the power source with rubbish (or garbage as Americans like to call it, or trash!). In the Mr Fusion reactor at the back! The camcorder that Marty used to record the first time travel experiment on the 26th October 1985 at 1:21am. This one was completely random and unexpected. Seen on Navigation Street close to The Mailbox (on the 14th March 2015) was this wedding hire car that looked like the Ecto 1A from the movie Ghostbusters II (released in 1989). It was one of the first movies I saw a as child during the Christmas season of 1989 (Vigo the Carpathian was scary for an 7 year old). The car headed under the underpass below Suffolk Street Queensway, before turning back around. It had the distincitive two fingers Ghostbuster logo on the car. If there's something strange, in the neighbourhood, who ya gunna call? Reports of a ghost on the loose at The Mailbox was a false alarm. They were now seen heading in the direction of Birmingham New Street Station. At the time a movie was in production for 2016, which turned out to be an all female reboot. Recently another movie in the original Ghostbusters movie timeline has been announced for summer 2020. The car does look pretty cool don't you think? Seen here going past Sainsbury's Local near the Orion Building, stuck in traffic. Bustin' makes me feel good! Two in the box, ready to go, we be fast and they be slow! Another Ghostbusters car made an appearance at Broadway Plaza near Ladywood Middleway (outside the casino and what was the former entrance to the ex Children's Hospital) on the 23rd July 2016. I think this was while the Ghostbusters (2016) movie was in cinemas (also known as Ghosbusters: Answer the Call). The car is the Ecto 1 from the original Ghostbusters from 1984. This is obviously based on the car from the first Ghostbusters movie, as it has the original Ghostbusters no ghosts logo on it. Rumour of a ghost on the loose at the former Children's Hospital was a false alarm! Although maybe Broadway Plaza spotted Slimer flying around, and slimming people? From where the Ghostbusters car was, you can head up the path to the Odeon cinema. It used to be an AMC until 2012. Last year in 2018, Odeon turned it into an Odeon Luxe. In January 2019 it was announced that a new Ghostbusters movie will be made for a summer 2020 release set in the original Ghostbusters movie universe. Just over a year later on the 26th August 2017, the Batmobile from the movie Batman (released in 1989) was seen in the same spot as the Ecto 1 the year before. A version of it was also used in Batman Returns from 1992. Like all the cars here, this is a replica and not a screen used car. It was Superhero Day at Broadway Plaza, although I didn't see Batman around, just his car! My first Batman movie at the cinema was Batman Forever in 1995. I was too young when the first two movies came out (later saw them on TV). I've seen all live action Batman movies (of all incarnations) at the big screen since. The most recent appearance for Batman was in Justice League that came out in 2017, and before that Batman v Superman: Dawn of Justice in 2016. There was also the Lego Batman Movie which would have been more suitable for young kids. I wasn't aware of Broadway Plaza having a movie car like this there in 2018, as I didn't see anything on their social media accounts. Then again I stopped going to Odeon Broadway Plaza when they turned it into a Luxe. I prefer my cinemas to have normal seats, so I now go to either: Odeon New Street, Cineworld Broad Street or Empire Great Park Birmingham (Rubery). We hope you enjoy our gallery of 50 superb photographs taken during a guided tour of St Philip's Cathedral with Birmingham's People with Passion in January 2019. 28 Jan 2019 - Elliott Brown Did you know? A group of Birmingham We Are photographers along with Jonathan Bostock visted Birmingham Cathedral on the 26th January 2019. This post will be about the history of the Cathedral. My older exterior photos taken over the years passing through the Cathedral Square. New interiors taken on the visit with the group. More details on the history in the post below. Originally built as a Parish Church on a plot of land in what is now the Colmore Business District (it wasn't that back in the 1700s). First built in 1715. The cathedral celebrated their 300th birthday in 2015. It was designed in the Baroque style by Thomas Archer. It was granted Cathedral Status in 1905. Around 16 years after Birmingham was granted City Status! Located between Colmore Row, Temple Row, Temple Row West and St Philip's Place. A Grade I listed building. It is the third smallest cathedral in England. This view below from June 2009. The rear side of the cathedral. Colmore Row is to the right, Temple Row to the left. The 2nd view also from June 2009, similar to the above view. It is easy to walk between the bus interchanges through the Cathedral Square. Some people call it the Pigeon Park (I don't). I prefer something like the St Philip's Churchyard or St Philip's Cathedral Grounds. Victoria Square is a short distance away from here. The Grand Hotel at the time was under scaffolding, and restoration had yet to begin at that time. Birmingham Snow Hill Station is over to the right of here. This view below was taken during April 2011. With a nice blue sky. The stone looks especially nice in that light. The cathedral was designed in 1709 and consecrated in 1715. But the tower wasn't completed until 1725. It was a major monument of the English Baroque. J A Chatwin refaced the church between 1864 to 1869. Was restored after World War 2 between 1947 to 1948. A more recent refurbishment took place in 2015 ahead of it's 300th anniversary. Another April 2011 view. If you are heading from Bull Street, then up Temple Row, you might go through the entrance and up this way towards Colmore Row / Temple Row West. Scaffolding still on the Grand Hotel. The BT Tower was also visible while it was nice and sunny that spring day! The Parish Church of St Martin was too small for the growing town in the early 18th century, and this land was found, to found a new church. As it was expected that the town would grow. This view was taken in March 2014, on anther sunny early spring day. The main entrance to the Cathedral is through the big doors on the right. The bell tower seen above. The weather vane and orb seen high above the clock was restored later in 2014. The restoration was funded by the Calthorpe Estates. As the heirs of Sir Richard Gough, who originally asked King George I for funds to finish of the tower. Seen in the snow of December 2017, as I walked from St Philip's Cathedral towards St Paul's Church in the Jewellery Quarter. St Philip's used to be surrounded by a Georgian square, but most of the buildings have changed over the years. Many of the buildings on Colmore Row and Temple Row West are from the Victorian era. The buildings on Temple Row are mostly from the 20th century. Really looks like a picture postcard with snow, perfect for a Christmas card style image! My most recent exterior photo was taken in January 2019. I was heading to Victoria Square to check out the projections celebrating Birmingham's 130th birthday as a City. This is the side facing Colmore Row. It looks quite nice lit up after dark. Some memorials seen outside of the Cathedral. Charles Gore (1853–1932) was the First Bishop of Birmingham. He was bishop from 1905 until 1911. Previously he was also Bishop of Worcester from 1901 until he helped create the Diocse of Birmingham. He was later Bishop of Oxford from 1911 until 1919. The bronze statue seen outside of the cathedral was made by Stirling Lee in 1914 and is Grade II listed. This view from May 2009. Also seen in May 2009 was this obelisk. The Burnaby Obelisk. Grade II listed. It was in memory of Frederick G. Burnaby (1842 - 1885). He stood as a Conservative Party candidate for Birmingham in 1880 (as an MP). He died at Battle of Abu Klea, Sudan on January 16th 1885. It was made by Robert Bridgeman of Lichfield. He also fought at Khiva in 1875, a well as Abu Klea in 1885. There is an oval portrait medallion on one side of the obelisk. 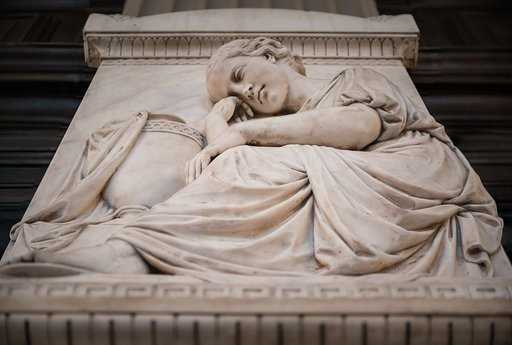 It is made of Portland stone and was unveiled by Lord Charles Beresford on the 13th November 1885. This banner was seen in the entrance hall during 2015. Welcome Come & See. December 2015 was near the end of the tri-centenary year. 1715 - 2015 (300 years since the Cathedral was built as a Church). The banner is not there now. Interior views taken during the Birmingham We Are morning visit. This end from close to the entrance as I waited for other members of the group to arrive. The trio of Burne-Jones windows are at the far end near the High Alter. This side, with the High Alter behind me. Looking towards the fourth Burne-Jones window below the bell tower. We only had access to the ground floor, so were unable to go upstairs or up the tower. Now closer to the end below the bell tower, and again looking towards the High Alter end. Plenty of columns along the aisle and memorials to those who are buried in the cathedral. Now a look at the four Edward Burne-Jones windows. They were made between 1885 and 1897. Burne-Jones designed them while William Morris made them. This one is the stained glass window below the bell tower. A winged angel with a horn, similar to the Shofar used at Rosh Hashanah. The main central window at the High Alter end. High alter window on the right, a crucifixion scene. The final window at the high alter end on the left. They look better from the inside. From the outside you can't really see the colours. Organ. The organ dates to 1715 and has been restored and re-gilded. It's sound replicates that of an orchestra. The Bishops Seat. This is where the Bishop of Birmingham sits during a service. Look above and see the Bishop's hat or mitre. The seat is also known as a Cathedra. High Alter Cross. It was made in the Jewellery Quarter by a jeweller and artist called John Donald. It is a stunning cross with a piece of quartz at the centre. It is seen below the trio of Burne-Jones windows. Birmingham Bell. It came from the HMS Birmingham and is dated 1976. Was used as a font for baptisms aboard the ship. There has been at least three Navy ships called HMS Birmingham. The first from 1913 - 1931, the second from 1936 - 1960, and the third from 1976 - 1999. The bell is rung for baptisms today. 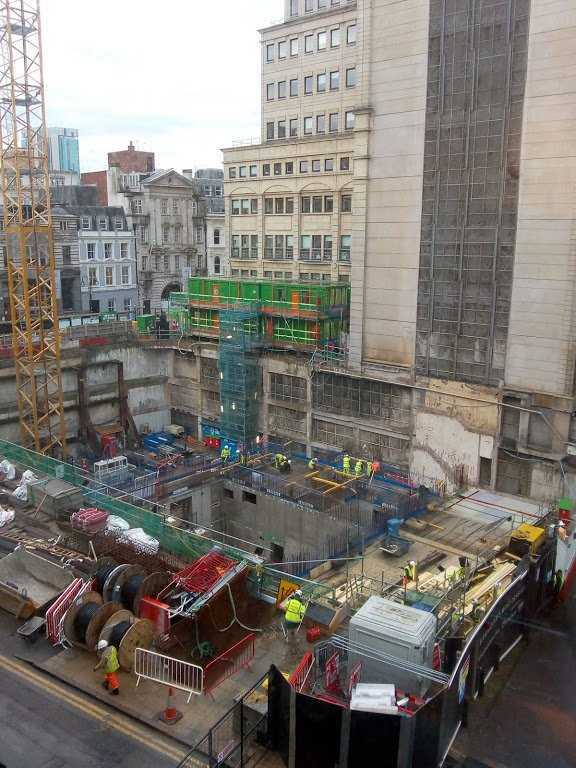 A peak above the hoardings of 103 Colmore Row reveals a hive of activity. 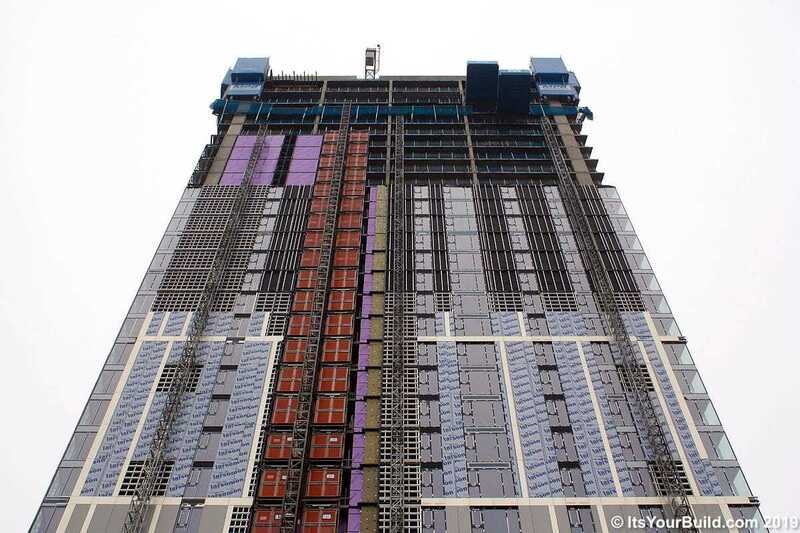 This 223,631 sq.ft office tower is the largest under construction outside of London. Photo: Gtr Bham Dev. The building will feature restaurants on the ground & top floors, winter garden & an 18th floor terrace. Here we have artists impressions of the final build from construction lead BAM and some photos of the demolition of the old Natwest Tower. Two Chamberlain Square is now structurally complete, the front collanade almost finished, work on the exterior next. Local people will be able to stop calling it the 'car park' soon. More photos in the full post. Bank Tower Two on Broad Street is now structurally complete with the cladding chasing up behind fast. 24 Jan 2019 - Elliott Brown Did you know? Our obsession with coffee shops / coffee houses didn't start in the early 21st century. You can go back to the late 18th century. Freeth's Coffee House was run by John Freeth, also known as the Celebrity Landlord and poet. His coffee house was on the corner of Bell Street and Lease Lane in Birmingham. A blue plaque at the Bullring marks the site near Bill's in the East Mall. Known as the Birmingham Poet, John Freeth was born in 1731 and died in 1808. He was also known as Poet Freeth. He was an innkeeper, poet and songwriter. He owned Freeth's Coffee House between 1768 and his death in 1808. Also known as the Celebrity Landlord, he sat for many portraits during his lifetime. This one seen at the Birmingham History Galleries at the Birmingham Museum & Art Gallery, was painted by an unknown artist. He was one of the major figures in Birmingham during the Midlands Enlightenment. James Murray (Linen draper), John Wilkes (Cheese factor), John Freeth (Brassfounder), Richard Webster (Poet and publican), Jeremiah Vaux (Surgeon), John Collard (Hatter), John Miles (Lamp manufacturer), Samuel Toy (Steel toy manufacturer), James Bisset (Artist and owner of museum), Joseph Fearon (Tin merchant), James Sketchley (Auctioneer) and Joseph Blunt (Brazier). It is more formerly known as John Freeth and His Circle. Time for a look around Freeth's Coffee House. It was the popular name of the Leicester Arms which was located on the corner of Bell Street and Lease Lane in Birmingham. It was first a tavern and later a coffee house, operating from 1736 until 1832. John Freeth was the landlord during the second half of the 18th century, and he would regularly entertain his customers with songs and poetry. It was one of the most celebrated meeting places in Georgian England. Small businessmen and lawyers would conduct business here. Radical groups such as the Birmingham Book Club would regularly meet here. This window exhibit at the Birmingham History Galleries shows a view out of the window to the Statue of Horatio Nelson which would place it sometime after 1809, or later in the 19th century (after John Freeth had passed away). The statue is still there today and has survived various incarnations of the Bullring. Also in Freeth's Coffee House was this Grandfather Clock. Is it time for coffee? It was placed close to the window in the Birmingham History Galleries. Heading over to the Bullring there is a blue plaque near Bill's from the Birmingham Civic Society, close to the East Mall (Selfridges is not that far away). The plaque reads: "John Freeth The Birmingham Poet of Bell Street 1731 - 1808". A shop called Mango was previously in the units now occupied by Bill's. At Bill's you can have Breakfast, Lunch & Dinner. Open from 8am 'til late. This modern scene of th Horatio Nelson statue at the Bullring was from the summer of 2009. The closest coffee house / coffee shop to where Freeth's Coffee House was, is probably this Starbucks Coffee (still there in 2019). The statue has been Grade II* listed since 1952. The statue was moved in 1961, and later after the recent Bullring redevelopment was moved closer to St Martin's Church. In 2005 the railings were restored. A bonus John Freeth site coming up. If you are ever on a bus heading round Camp Hill Circus between Camp Hill and the Stratford Road, you might notice a plaque on the dual carriageway of Bordesley Middleway. I once went to check it out, and I found a plaque about the site of the Ship Inn. A pub on this site from about 1560 to 1972. Most famous for being Prince Rupert's headquarters in 1643, before he attacked Birmingham with a Royalist army during the Civil War. Is probably where the Camp Hill name came from. It's hard to imagine now, but a pub used to be on this site until the 1970s. When John Freeth and his friends came here in the 18th century, it was known as The Anchor. The pub was at the corner of Sandy Lane and Camp Hill. The old inn was pulled down in 1867. A new pub was built on the foundations of it's site called the Ship Hotel. But it only survived until the road's around here were realigned in the 1970s. The Camp Hill Flyover was built, but it was only a temporary solution to the traffic problems around here. Camp Hill Circus was built in the 1980s. Today it is free flowing, sometimes has a lot of traffic during rush hour. Only traffic lights are for the pelican crossings. I think they should have permanent lights at all junctions there (Stratford Road from the south, Highgate Middleway to the west, Camp Hill to the north and Bordesley Middleway to the east). The only surviving pub near here is the Brewer & Baker at the corner of Camp Hill and Bordesley Middleway (near Old Camp Hill). But it is quite derelict, been closed for years, and was a fire there in recent years. Could do with either A: restoring, or B: demolishing. Should never have been left in that state! 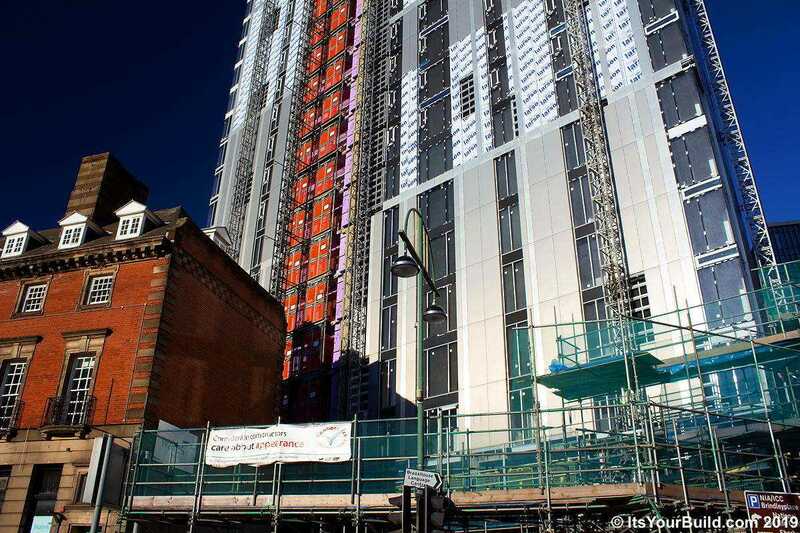 People with Passion at ItsyourBuild are joined by the team of Greater Birmingham Developments to promote the valuable contribution of community to the built environment and developments as they continue to add to the urban landscape of the City. 23 Jan 2019 - Elliott Brown Did you know? HSBC UK have recently opened up their UK HQ right here in Birmingham at 1 Centenary Square at Arena Central, but did you know the bank originated as the Midland Bank founded right here in Birmingham! Former City Centre banks including one on New Street (used to later be Waterstone's is now Apple) and another one on Bennetts Hill (now the Cosy Club). HSBC bought the Midland in 1992. The Midland Bank was founded in Birmingham in 1836 by Charles Geach, who used to have a branch on Union Street. Early international holdings included an early deal with the The Hongkong and Shanghai Banking Corporation in 1907 (there future owners). HSBC Holdings plc took over the bank in 1992, and phased the Midland Bank name out by 1999 in favour of HSBC Bank. Branches are now branded as HSBC UK. For many years, this building on the corner of New Street and Stephenson Place was a Waterstone's store, it is now an Apple store. Photo below from 2009. The first Midland Metro extension was built round the back of this former bank building, finally opening in 2016. The building was built in 1868 - 69 and it was originally the Head Offices of the Midland Bank. It was designed in the classical style by Edward Holmes and an extension was built in 1875. It's now a Grade II listed building. When it was listed in 1970 it was known as the Midland Bank International Division. The rear entrance was altered when the Midland Metro extension was built, but that is now closed since Apple took over the building. While HSBC are not in the classical building that is now used by Apple, they are still at the other corner of New Street and Stephenson Place, close to the ramp up to Grand Central (previously the Pallasades). This branch seen in 2014, is now branded HSBC UK, like other HSBC banks around the country. Above it is a former office block, the Exchange Buildings, that was owned by Aviva. There is now a Premier Inn hotel up there, so not that far from Birmingham New Street Station. "Welcome to Birmingham New Street a branch of the world's local bank". Another former Midland Bank located in Birmingham City Centre is on the corner of Bennetts Hill and Waterloo Street in the Colmore Business District. It is now the Cosy Club. 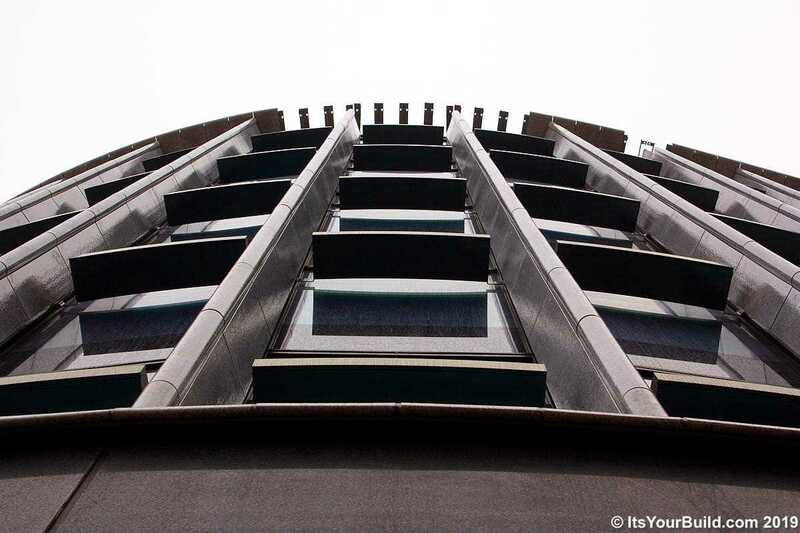 In 2009 (photo below) the building was occupied by Webb Gray & Partners Ltd (an architectural practice). This building is also a Grade II listed building and is even older than the former bank on New Street! Built in 1830 by Rickman and Eutchinson, it was altered in 1868 by H R Yeoville Thomason. Made of stone. It has giant Giant Corinthian columns. It was fully restored and the stone cleaned when it was converted into the Cosy Club in 2015. HSBC UK recently moved into their new UK HQ in late 2018. Construction of One Centenary Square began in 2015 and was completed in late 2018. Part of the Arena Central redevelopment opposite Centenary Square and on part of what was Broad Street. Historically, the site was previously where Central TV (ATV before that) had their studios in a former Masonic Hall. The hall was demolished in 2006, and the site lay empty until the mid 2010's. It's next to the Alpha Tower and the Municipal Bank (which is soon to be taken over by the University of Birmingham). This view from near the Amphitheatre of the Library of Birmingham. The redevelopment of the square might be completed by Spring or Summer 2019 (or later?). A view zoomed down from the Secret Garden at the Library of Birmingham. The view is up Newhall Hill and Frederick Street towards the Chamberlain Clock Tower. On the left is the Jewellery Quarter branch of HSBC UK. The 101 bus heads left onto Warstone Lane past the bank. There is a branch of Barclays Bank at the opposite corner. Recently been seeing other peoples photos on social media of this new painted advert for HSBC UK, so had to check it out myself. HSBC UK currently have an advertising campaign, where they are using four cities as well as a general advert. Including Birmingham, London, Manchester and Leeds. This of course is the Birmingham variant. Behind the Rose Villa Tavern on Warstone Lane, it is close to Vyse Street in what is now called Golden Square. Not just home of the Brummie. You're home to Heavy Metal, Mr Egg, Bostin Cobs, The Shire and the First Stamp. You're not an island. You're a Workshop of the World that's part of something far, far bigger. And you're our home. 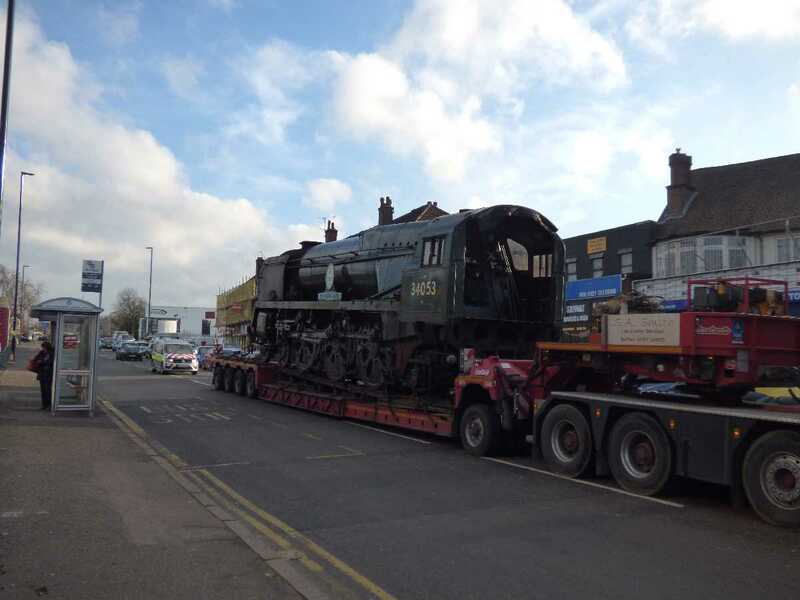 Not something you see every day: a steam locomotive on the back of a lorry! I only popped to Tyseley to check out some trains heading past Tyseley Station. When I walked back down to the Warwick Road on the 13th December 2018, saw a steam locomotive on the back of a lorry. Sir Keith Park 34053 was probably getting near to the Tyseley Locomotive Works. The walk to Acocks Green, but Amey had barriers out for new lampposts! Not something you expect to see on the road in Birmingham! A lorry with a steam locomotive on the back of it. Although I have in the past seen a Cross Country train on the back of a lorry once. It was the 13th December 2018, and this small convoy was approaching the Tyseley Locomotive Works on the Warwick Road in Tyseley. Seen here passing the Cousins furniture store (mostly selling sofas etc). The locomotive is currently operated by the Swanage Railway. So it was probably coming to Tyseley for repairs or maintenance? A little bit of history of the locomotive. It was built in 1947 at the Brighton Works. It's original number ID was 21C153. It was a SR Battle of Britain class (Southern Railway Battle of Britain class 4-6-2 Pacific steam locomotive). It gained the number 34053 in 1948 when British Railways was formed. In 1960 it was transfered to the Bournemouth Depot where it was on the Pines Express on the Somerset & Dorset Line. She remained in Bournemouth until being withdrawn from service in 1965. After being withdrawn from service in 1965, she was towed to the Barry scrapyard in South Wales. But the locomotive wasn't scrapped. She was eventually towed to Barry Island where she remained for 18 years. A new owner bought her for preservation in 1979, but she didn't depart Barry Island until 1984. She was moved to Hull, but little was done to her. In 1992 she was sold to another owner and moved to Crewe. Again litte was done to her. By 1997 she was moved to the West Somerset Railway and was later purchased by Southern Locomotives Ltd in 2000. Restoration finally began in 2008. Returned to steam by 2012 not at the Swanage Railway as intended, but at the Severn Valley Railway. Naming ceremony took place in 2013 as Sir Keith Park at Bridgnorth. She can only run on heritage railways, but is not certified to run on National Rail railway lines. Probably why it was transferred by lorry! A super dull day for this update but interesting how metalic the building can look in certain light, some of the massive windows at street level have been installed. More photos in the full post. 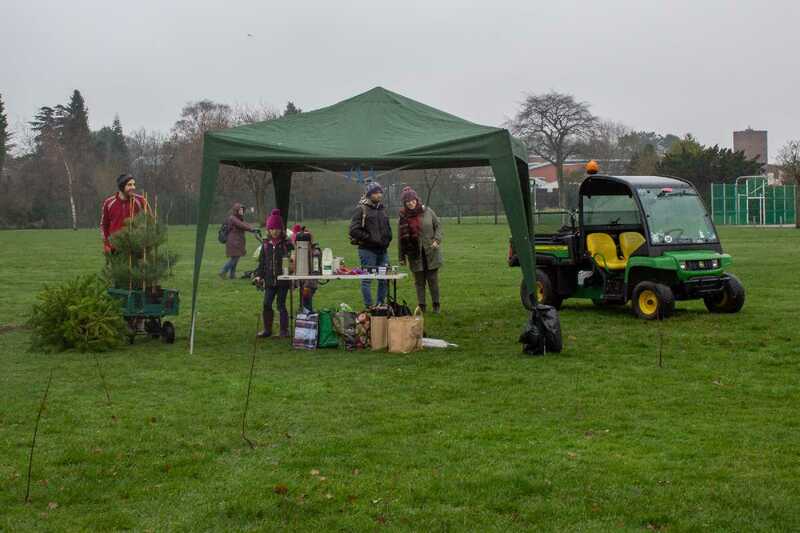 Birmingham Trees For Life brought 500 saplings to be planted in Kings Heath Park, in liaison with the Park Rangers. Around 80 people attended the tree planting event (January 19th January 2019) including - Councillor Mike Leddy, & Councillor Mohammed Azim who also participated in the tree planting. We can all enjoy seeing these saplings mature in decades to come! 20 Jan 2019 - Elliott Brown Did you know? While car production at Longbridge has long since gone (apart from the small remaining factory for MG Motor), the site that is now Longbridge Town Centre used to house the Austin Works (later MG Rover until 2005). Herbert Austin founded the Austin Motor Company in 1905 (before Longbridge was in Birmingham). Also nearby is the Austin Village which was built to house workers from 1917. He was born in 1866 in Little Missenden, Buckinghamshire and he died in Birmingham aged 74 in 1941. He moved to Birmingham in the 1890s setting up his first motor company on Broad Street, but the Broad Street factory site was too small, so he bought bigger premises in Aston. He later took over an old print works site in Longbridge in 1905. At this time Longbridge was in Worcestershire, and didn't become part of the City of Birmingham until 1911. It was here that he set up the Austin car works becoming one of the greatest car manufacturers in the world. For a period from 1918 to 1924 he was a Conservative MP for Birmingham Kings Norton. He was knighted in 1917 and in 1936 he was created Baron Austin, of Longbridge in the City of Birmingham. Also known as Lord Austin of Longbridge. After MG Rover collapsed in 2005, the site was developed by St Modwen over the years, including a new Town Centre, Bournville College moved there by 2012. A new park was developed and opened in 2013 called Austin Park. It runs from the Bristol Road South towards Longbridge Town Centre alongside the River Rea. A former railway line ran towards Halesowen, and the remains of the signal box and old railway station were eventually demolished. It's unlikely that this railway line will ever be restored, now that the park and town centre are here. The Town Centre includes a Sainsbury's supermarket, a Premier Inn hotel and a Marks & Spencer store. Further to the right of here, they built retirement homes and houses along the land up Lickey Road. I first went to have a look around Longbridge in 2010. Back then many of the former factory buildings along Lickey Road had yet to be demolished. 5 years after MG Rover collapsed, they were very derelict. Once they were demolished, a retirement village was built by 2016 up the Lickey Road site. It opened in 2017. To think the motor works lasted on this site from 1905 to 2005, a period of 100 years! Now it is becoming a new town centre. There is also a business park nearby. Many plots of land yet to be built on. While Rover ceased to exist, a Chinese company bought the rights to use the MG name. And there is a small presence on a site on Lowhill Lane in Longbridge. MG Motor is owned by SAIC Motor UK (who themselves are owned by SAIC Motor based in Shanghai, China). Not far from here is another park called Cofton Park, where Pope Benedict XVI held mass in 2010. I went to Cofton Park in 2013 trying to get to the Lickey Hills Country Park, and the MG Motor buildings were visible from up the hill in the park. It was announced in 2016 that all car production had ceased at Longbridge, and after that MG Motor cars would be imported into the UK. Back to Herbert Austin, and a village that he built for his workers. Austin Village was built in 1917. It is built on a site between Northfield and Longbridge in Turves Green. More workers had to be taken on during the First World War and when his factory began building tanks and aircraft, he built a new estate for his workers. He imported 200 cedar-wood pre-fabricated bungalows from the Aladdin Company, Bay City, Michigan, USA. They were shipped across the Atlantic, and survived potental loss to U-boat attacks. Many trees were planted around the village. This view is of Central Avenue. At the top end is a pair of blue plaques. One for Sir Herbert Austin and the other for the Austin Village. A red post box is at this end. I visited in April 2012. While having a look around the Austin Village during April 2012, it was possible at the time to see the remaining MG Rover / Austin motor works, before most of them were demolished. The view was from Coney Green Drive. Most of these buildings were demolished on the right of the chimney, and houses were later built on the site. The MG Motor factory that survives down to Lowhill Lane. What will the future of this site be, will the rest of the factory have to be demolished for even more housing, now that car production has stopped on the site? Over in Northfield is the Northfield Bypass, called the Sir Herbert Austin Way. This end near Sainsbury's seen during May 2013. The road bypasses the Northfield High Street on the Bristol Road South (although all major bus routes still use it). Sainsbury's had an extension a few years later and the Sainsbury's Cafe is now on the first floor. A new Starbucks Drive Thru, the first in Birmingham, opened on the bypass in 2017 near Vineyard Road and Bellfield Infant School. The success of this Starbucks Drive Thru probably led to the one that opened in 2018 at the Maypole. There are several vintage Austin motorcars on display at Thinktank at Millennium Point. I first visted with my camera in April 2013. In the Move It section on Level O (the ground floor) was various old cars and bikes. As you enter, you see this old car on a rotating turntable. It's the Austin Seven Tourer built in 1923. It was economical but reliable. It was smaller and cheaper than other cars at the time, but was considered to be just as reliable and comfortable. Car ownership was no logner just for the wealthy. Watch as the car goes around and around! I assume it still does that, if it's in the same spot as it was then? Yes this car was on the side on the glass wall! It's the Austin 10 'Lichfield' Motorcar and it was built in 1935. One of 27,000 made by the Austin Motor Company at Longbridge. You might have to tilt your head 90 degrees to the right to see it right up! In July 2011, on a visit to the stately home that is Holkham Hall in Norfolk, saw this poster in the Stable Coach Block. The Austin Seven Garage Chart. It clearly says that the Austin Motor Co. Ltd was from Longbridge, Birmingham. Many museums all over the UK have Austin cars in their collection, and it's not just museums, stately homes sometimes have a collection of vintage cars on display! Another museum well worth a visit in the West Midlands is the Coventry Transport Museum. This is a Austin Seven Swallow dating to about 1928. My first visit to this museum was during March 2015. This classic car was in the Jaguar Heritage Gallery. Many cars and motorbikes were built in Coventry, but they did also have a selection of Jaguar's and MG's on display here. It was probably made in Coventry. My second visit to the Coventry Transport Museum was during April 2018. You can get the X1 bus all the way down the Coventry Road, via Birmingham Airport to the bus station in Coventry. The museum is nearby. A much shorter walk compared to getting a train from Birmingham New Street to Coventry and walking, like I've done in the past. Onto this car. It's an Austin 7 Swallow built in 1929. The chassis and engine of the car was made by the Austin Motor Company at Longbridge, Birmingham. The body built by the Swallow Coachbuilding Company of Holbrooks, Coventry, who changed their name to Jaguar. Jaguar later became known for making fast, sporty cars. Take the post for a great selection of 50 photographs from 'People with Passion'. 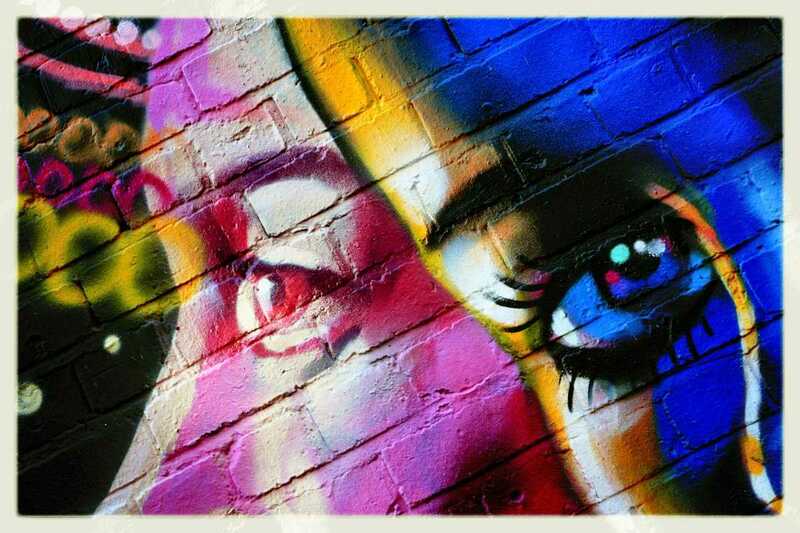 The photography takes you on a non stop tour through the streets of Digbeth, sharing the fantastic street art, the historic buildings, thriving businesses, Custard Factory, art venues & a neighbourhood that has been named the 'coolest' of Birmingham's neighbourhoods! Enjoy! 16 Jan 2019 - Elliott Brown Did you know? Another set of historic buildings, this time in Northfield. The old village centre is a short walk away from the Great Stone Road, heading down Church Road to St Laurence's Church and the Great Stone Inn, around Church Hill. The Great Stone can be found here as well as a former Village Pound (a small 17th century jail). I first headed down to this part of Northfield in June 2010. So most of my photos of the church and the pub were taken back then. More recently, I returned in May 2018 when I was told about a pair of blue plaques for The Great Stone and the Village Pound. This is the parish church of Northfield. Located around Church Hill, and near Church Road. The heart of the old village centre of Northfield. 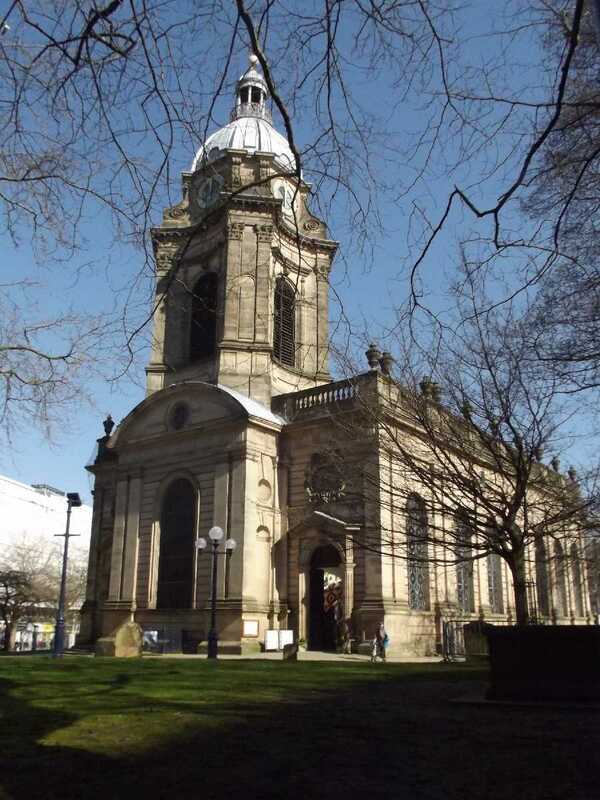 The church dates to the 12th century, and is one of the oldest buildings in Birmingham. It is a Grade I listed building. If you don't know where this is, if getting off the bus in Northfield Town Centre, or off the train at Northfield Station, then it is close to the Great Stone Road. You can either get there by walking down Church Road or Rectory Road. From Northfield Station, Church Hill is nearby, and you could walk up there. The tower of St Laurence's Church. It also dates to the 12th century. Most of the church dates from the 12th, 13th, 14th and 15th centuries. The north aisle was built in 1900 by G F Bodley in the 14th century style. There is a churchyard around the Church of St Laurence with many gravestones. There was a War Grave extension, containing the graves of service personnel from World War I and World War II. This view is from close to Rectory Road with the tower behind close to Church Hill. There is a public footpath that starts from Rectory Road where you can see this view over the churchyard. A more recent view of St Laurence's Church from May 2018, when I was heading to check out the Village Pound. This is the view from round the bend on Church Hill. The Lych gate is seen on the left. And the Village Pound itself is to be found nearby on Church Road (look out for an old gate, more on that below). The pub seen in the old Northfield Village that is opposite of St Laurence's Church is The Great Stone Inn. A Grade II listed building dating to the 18th century. It is on the corner of Church Hill and Church Road in Northfield. The white paint stood out on this blue sky day back in June 2010. Full on view of The Great Stone public house. Takes you back 200 years if it wasn't for the car! At the time I wasn't aware of the Village Pound being so nearby (on Church Road to the right). The pub is at 158 Church Road and is now owned by the Stonegate Pub Company. They won an award in 2010 for the 'best managed house' and in 2011 for the 'best community pub in the East and West Midlands', in the Great British Pub Awards. I was looking for a pair of blue plaques I was made aware of in Northfield. The Village Pound and the Great Stone. Thought I almost missed them when I saw this gate and looked in, during May 2018. It is on Church Road, and is to the right of the Great Stone Inn. Beyond are houses. Stop here to look inside of the gate. A pink sandstone wall near the road. The Village Pound is a Grade II listed building and dates to the 17th century. A pound was for keeping stray animals, although I thought it was like a small jail. But just for animals if not people then! At the back is a wall to an outhouse of the Great Stone public house. In the middle of small courtyard is the Great Stone. The listing describes it as a "central monolithic stone". The boulder was moved by Birmingham City Council to this site in 1954 for road safety reasons. A glacial erratic boulder formed in an explosive volcanic eruption during the Ordovician period, 450-460 million years ago. During the ice age possibly up to 400,000 years ago, it was carried by an ice sheet from the Snowdon area of North Wales and deposited with many others around Northfield when the area was a frozen wasteland. For generations it lay at the corner of Church Road and Church Hill where it protected the Inn wall. In May 2018 and heading up Church Hill in Northfield. That day I got the train to Northfield Station, for the short walk up the hill to find the Village Pound, and it's pair of blue plaques. This is no 3 to 13 Church Hill. Not sure of the details, or how old these buildings are, but they look Victorian. A salon called Headways was on the right. Off Church Hill in Northfield for this building on Norton Close. It was St Laurence Church of England Infant School. A Grade II listed building. Built in 1837, with 1870 exteriors. Red brick with a slate roof. This was the original school, it also had a Master's house. The school is now on a different site in Northfield, now near Heath Road South. The former school building has been converted into flats. This is the back alley or path behind St Laurence's Church in Northfield. At the time in June 2010, I only went half way before turning back towards Rectory Road as I didn't want to get lost! Near the top of this path is that view of the church from near Rectory Road (see further up the post for that photo).